Hosted by film legend Francis Ford Coppola, "Lost & Found Sound and Beyond" feeds in early September, and again in mid-October for use during the 2004 holidays. Each hour of the program can be aired as a discrete broadcast. The hours are not newscast compatible, but will otherwise follow the standard :20/:40 broadcast clock. This new gathering of unique stories is the product of a sprawling nationwide collaboration of independent radio producers, artists, musicians, archivists, writers, NPR, public radio stations and listeners. 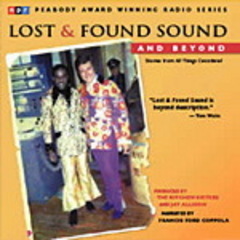 Lost and Found Sound was produced by two-time Peabody Award winning producers, The Kitchen Sisters (Nikki Silva & Davia Nelson) with Jay Allison. A sound hound himself, Francis Ford Coppola weaves these twelve richly-layered radio documentaries together with his own stories, reminiscences and home recordings, including his 1977 "interview" with five-year-old daughter Sofia Coppola about what she wants to be when she grows up. The stories include a surprising tale of Liberace and The Trinidad Tripoli Steelband, the saga of Sun Studios producer Sam Phillips, and narratives from Mohawk Indian ironworkers at the Twin Towers and Vietnamese manicurists in America.